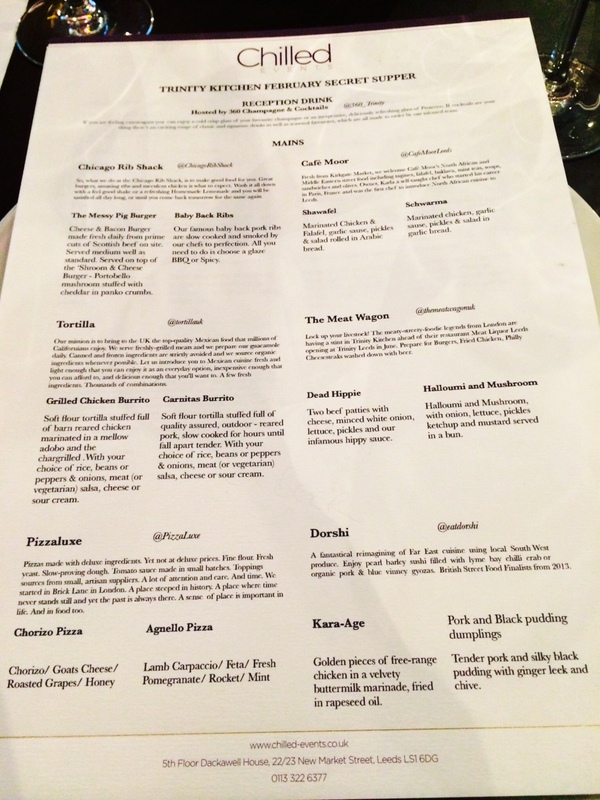 During this current rotation of traders at Trinity Kitchen, Dan and I were given the opportunity to spend a bit of time with, and sample the delicious morsels from Hay Latin America. Owner Fred Parkes and the gang hail from our West Yorkshire neighbour Huddersfield and they we very keen to share with the people of Leeds their take on South American food. Fred spent a number of months travelling through the southern parts of Latin America (Argentina, Chile) and was so inspired by the flavours he wanted to recreate them back home. We were particularly keen to chat to Fred given we’re holding our own Latin American event next month and wanted some insider advice! The stall itself serves up a range of different Latin American foods, including empanadas, quinoa and alfajores. The menu is constantly changing and has previously included Brazilian dough balls, Chilean hotdogs and most recently Chivitos – Uruguay’s national dish which is essentially a beautiful steak sandwich! Gold crescents of beautifully short, crisp pastry (which is made in house daily) and generously filled with tender rotisserie chicken and spiked with paprika and herbs. I could literally gobble down loads of these. Delicious. For non meat eaters the Hay team also have spinach and ricotta and also a mushroom variant. 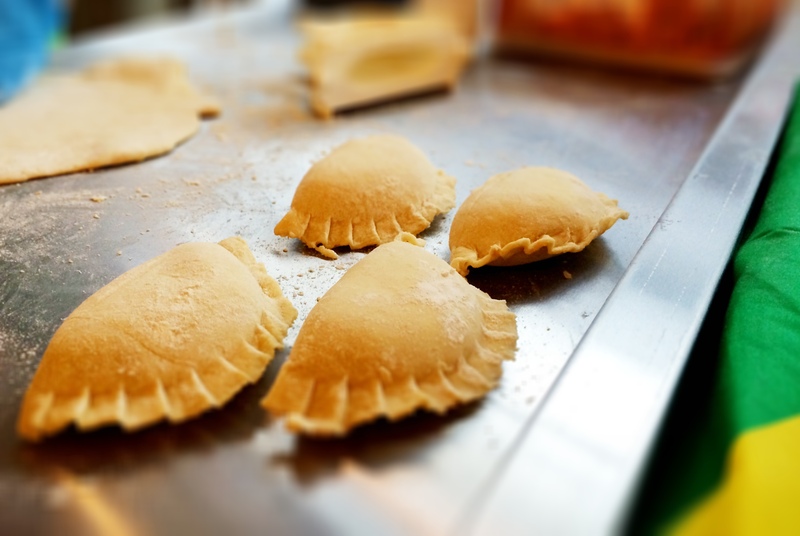 We also got to see some empanadas made in action. Exciting stuff! The quinoa was spiked with tomatoes, red onion, mint and lemon – very Ottolenghi-esque and felt like it was doing you good from the moment it touched your mouth! The chicken was the same rotisserie chicken from the empandas and was once again flavoursome and juicy. For veggies, the salad is served with guasacaca, the Venezualan equivalent of guacamole which is packed full of leafy herbs. For anyone who has had a peek at our previous Latin American events, you’ll know we love an alfajore! Buttery, crumbly shorbread biscuits sandwiched with all manor of fillings (traditionally dulce de leche or chocolate). Hay Latin America’s alfajores were delicately short and delicious to boot. alongside the traditional chocolate and caramel fillings, it was great to see the use of local ingredients in the form of a rhubarb filling – bringing a Yorkshire twist! Fred also gave us a sample of Torrentés white wine, an Argentinian variety which was beautifully crisp, sharp yet full bodied. Perfect with a fistful of empanadas!! Whilst the wine isn’t for sale, there are a range of Latin American beverages on offer including Inca Cola, coffees and green teas. It was great to see how passionate Fred was about this business and was keen to let people know all about Latin American food – perfect timing I’d say given the focus on the World Cup! Prices at Hay Latin America range from £1.10 for the smaller bites to £6.50 for the bigger plates which is a bargain. Get yourself over to Trinity Kitchen before the residency ends, although you can catch the team at World Feast every month on Briggate and also over in Huddersfield. 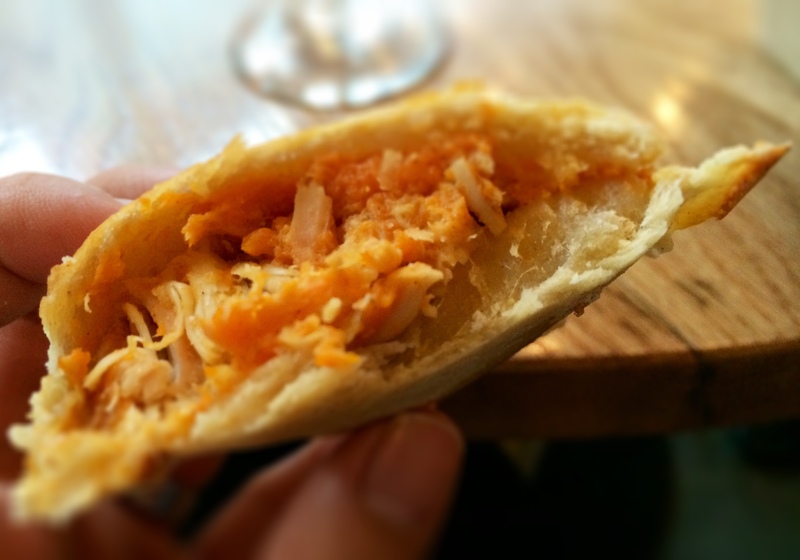 This entry was posted in Reviews and tagged Latin America, Latin American, Latin American food, Leeds, Reviews, Southern American food, Streetfood, Trinity Kitchen on June 15, 2014 by Susie Barker. A couple of weeks ago we were invited along to Trinity Kitchen to try out the new influx of street food vendors for the next few weeks. I was very excited to see another diverse range of food pit stops touting their wares. On offer for this session were MEATwagon, one of the UK’s foremost street food pioneers and are set to open up shop (MEATLiquor) in Leeds later this year. Two Asian inspired vendors, Dorshi who create fusion dishes from British Ingredients, Harajuku Kitchen from Edinburgh, who’ve travelled down to share their gyoza and okonomiyaki (Japanese pancake) with the residents of Leeds. Representing the northern contingent were Cafe Moor – beautiful Middle Eastern food from one of our beloved Leeds Market residents and favourite places to go for food on the go. For something sweet there was Headingley’s Love Rouge Bakery with all their sugary, cupcakey, baked goodness. 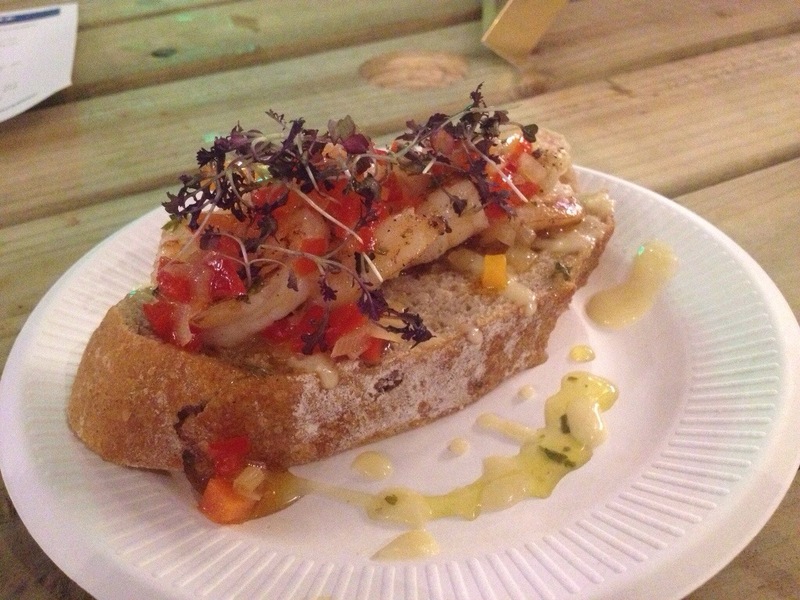 This entry was posted in Reviews and tagged Leeds, street food, street food vendors, Streetfood, Trinity Kitchen, Yorkshire on March 11, 2014 by Susie Barker. 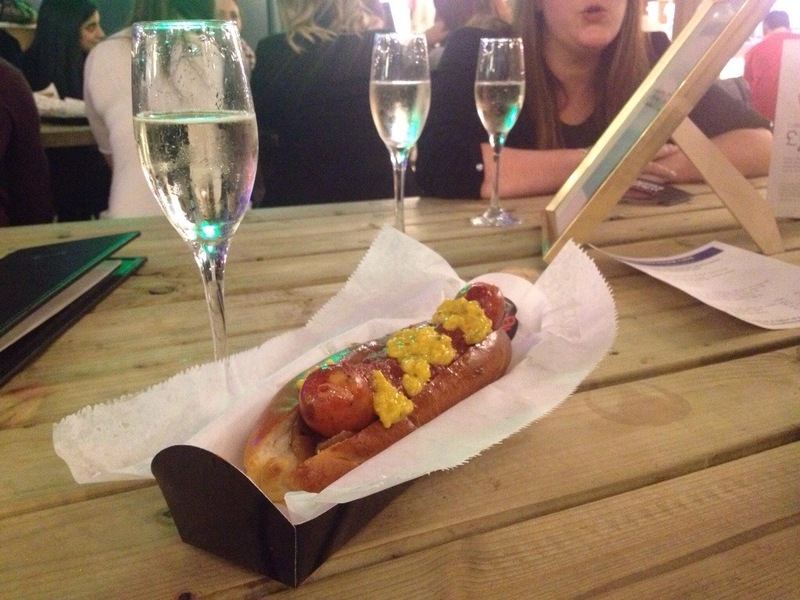 Earlier this week we had the pleasure of being invited to try out the new stallholders at Leeds’ Trinity Kitchen. Now open for about two months Trinity Kitchen has quickly become a go to haunt of ours when we need some cheap but exciting sustenance. Housed in a mahoosive warehouse style space above Boots, this is a part of Trinity that it is easy to miss unless it is a destination in itself. The concept is a good one. Rather than fall into the trap of a traditional shopping centre food court (McDonalds, Burger King, Harvester, need I say more?) 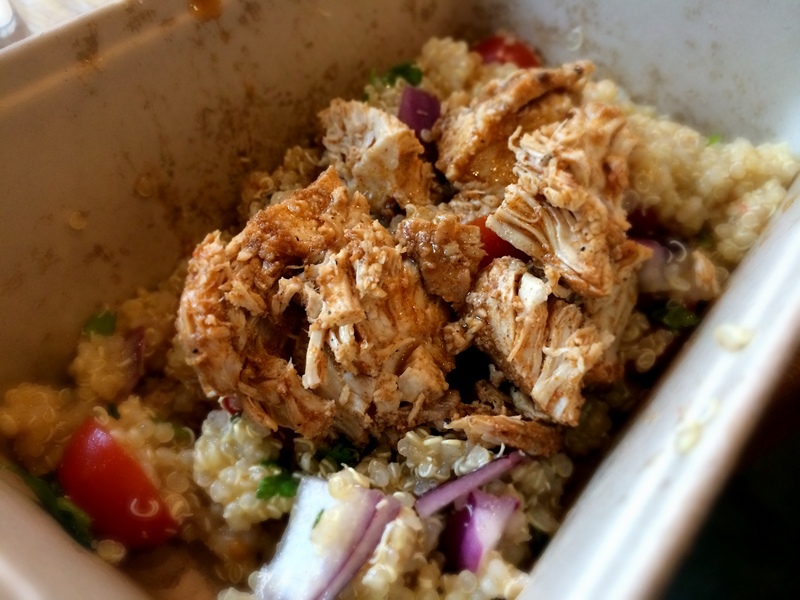 Trinity has gone down the route of a far more trendy offering – streetfood. The majority of the space is given over to fixed traders – Pho, fish and chips, burritos, champagne, cocktails, burgers. Yum. What’s more intriguing though, and which gets us going back each month, is the array of streetfood vendors who set up shop for a month, bringing the outside in. As a project manager this is a project I would have loved to see in action. Bringing the vendors, who are normally streetbased, into a shopping centre will have been no small feat. From the complex extraction system required, to the bonkers lift that brings their huge vehicles into Trinity, to the accommodation that needs to be secured for vendors not from Leeds. It must have been a nightmare sorting it all out which brings to mind one ingredient that made it all happen – passion. And passion for good food at that. And so to the vendors. We had a good chat with all of them who were a lovely bunch of foodie folk. It was the first time any of them had set up shop in a place like Trinity, they had no idea what to expect but between them there was a real party atmosphere. They hailed from all over the country – Leeds, London, Lincolnshire. I’ve heard a few criticisms about Trinity Kitchen in that people feel it should only be local vendors who grace the shopping centre floors. Now I’m all for a bit of localism but if that was the case then Trinity would fast run out of people to host. I think it’s a great way also to be exposed to lots of different food trends from all over the place. On to the food – we tried to get an array of treats from all of the vendors. 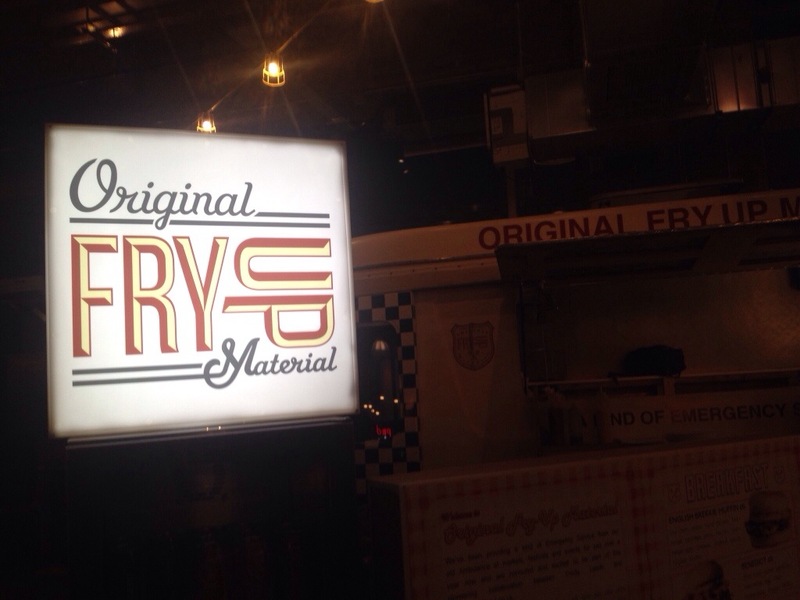 First up was Original Fry Up Material who were lovely Yorkshire boys (now London based) serving up fried breakfast themed muffins and burgers. 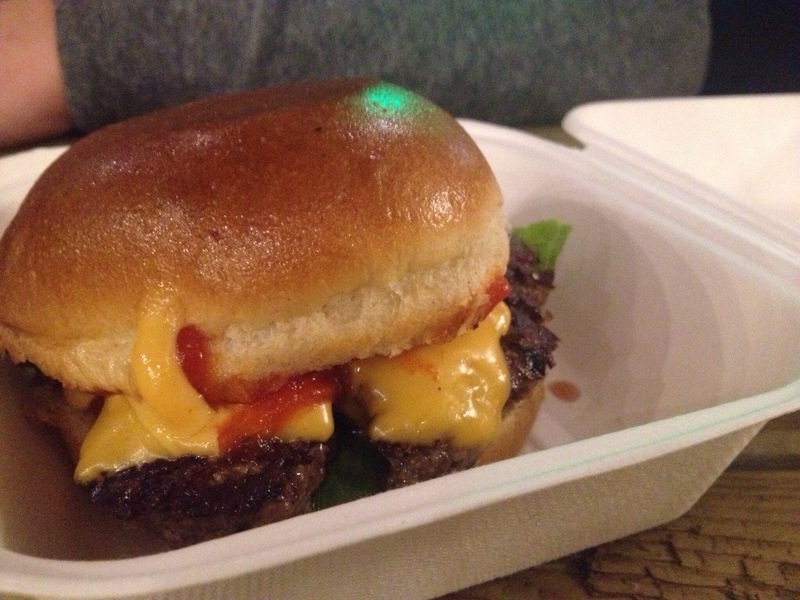 Richard tried their cheeseburger which was beautifully moist and rich. The lads have created a special beer with the Great Yorkshire Brewery, it hadn’t arrived when we were there but we’ll be going back to try it. My favourite of the night was Dogtown London, purveyors of gourmet hotdogs, including smoked dogs, veggie dogs and vegan dogs! Made from rare breed pigs (the meat ones that is!) 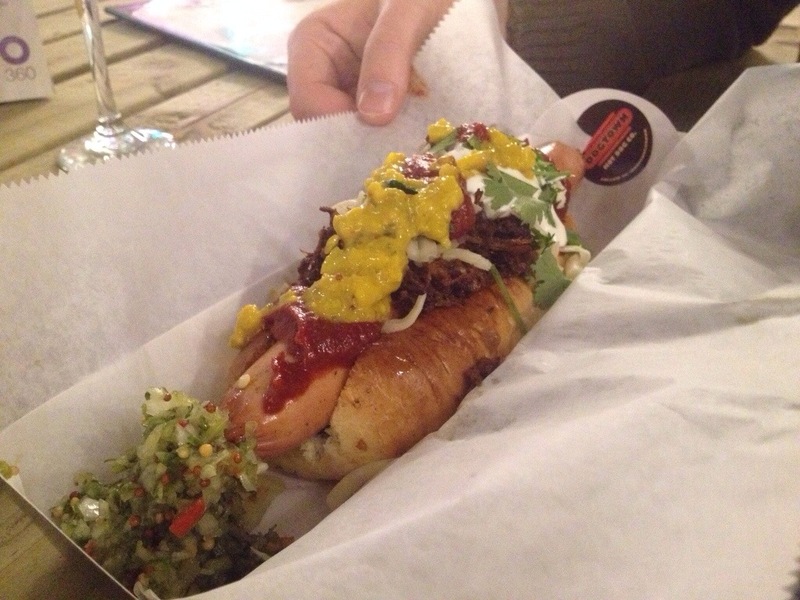 I had the humongous chilli cheese dog. The chilli was sweet and slow cooked with a perfect amount of sizzling spice. I adorned mine with extra smoky chipotle ketchup and piccalilli it was awesome but one of the more expensive options on offer at the kitchen at £8 a pop. Susie had the smoked dog which was huge for its £5 price tag. Leeds’ lovely Fish& were in the process of setting up but due to a number of last minute teething problems were not ready to go. This was a shame as I love their unique spin on a British classic. They will also be serving beer when fully functioning. 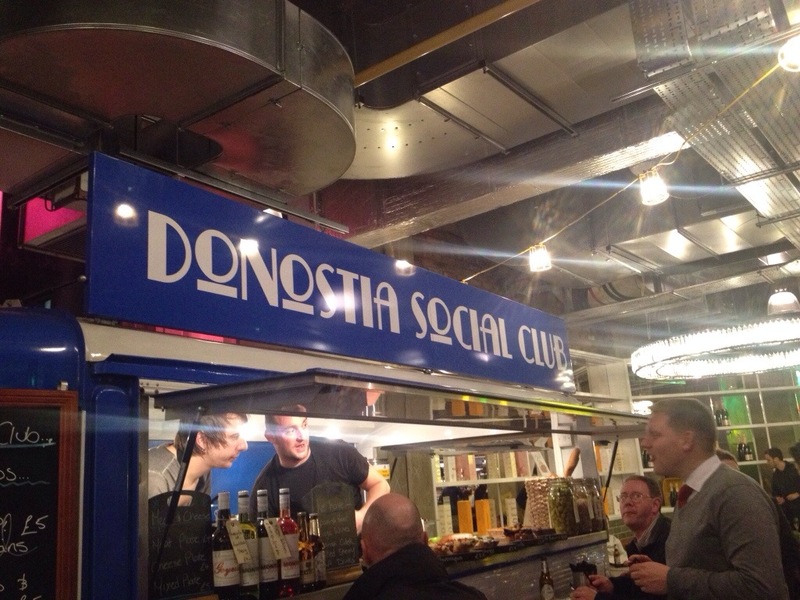 Perhaps the most unique stall was the Donastia Social Club – a San Sebastian inspired venture (think Basque tapas). This had all manner of mini treats to tempt us. 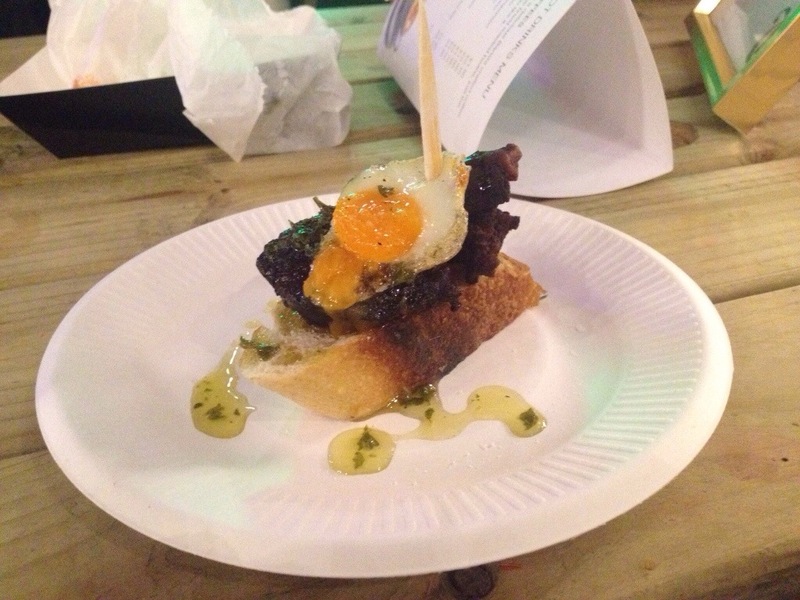 I had a little toast topped with creamy black pudding and a quail egg. 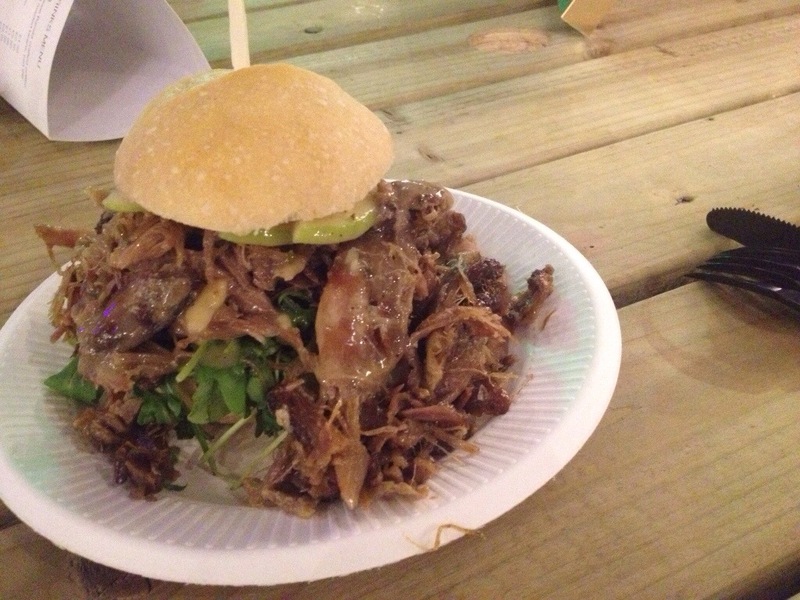 Susie had a huge duck slider, full of melt in the mouth slow cooked duck. Bethany had prawns with shallot salsa. Richard had seared scallops with a green chilli sauce. If streetfood makes you think greasy spoon, then you need to think again as this was pure class! I even paired mine with a beautiful glass of amontillado sherry, bliss. The final offering was crepes by Crepe Lucette, who have created a vintage and crepe fusion serving their wares dressed in fifties clobber and offering up mulled cider in vintage teapots. These ladies were lovely and full of fun. We found the crepe a bit stodgy and lacking seasoning, however it was packed full of filling (we had cheese, ham and chutney) and would be good filling festival fodder we thought. It will be interesting to see how long this aspect of Trinity Kitchen can last for. We’ll certainly be back to try out each new vendor as they arrive. We did wonder if summer festival season would have an impact on people’s availability. If that happens then we could always start a streetfood van anyway, what do you think?! Well done to Wendy on turning a great concept into a reality, and thanks for having us! 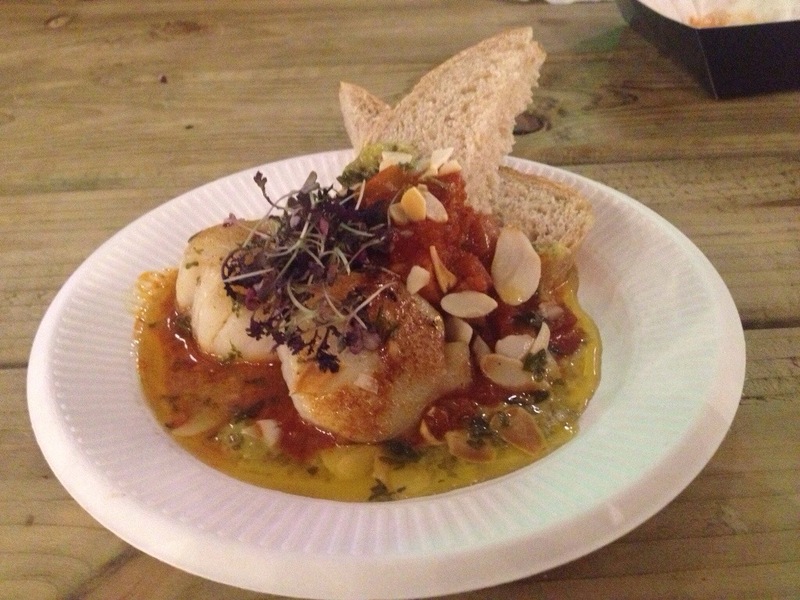 This entry was posted in Reviews and tagged Leeds, Streetfood, Trinity Kitchen on December 22, 2013 by martinimanleeds.